The New Comfort Pulse Technology System! 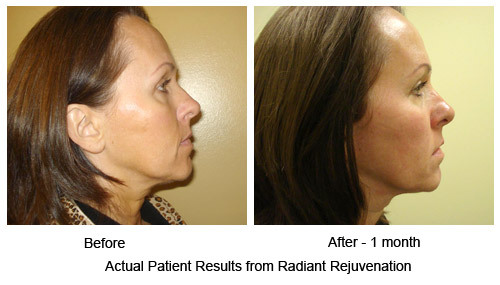 The Thermage procedure is available at Radiant Rejuvenation and Cosmetic Surgery in the Seattle area under the direction of Dr. Michael Lau and is performed by Susan Cummins, a certified medical esthetician who is one of the top performing Thermage certified technicians in Seattle and the Pacific Northwest. 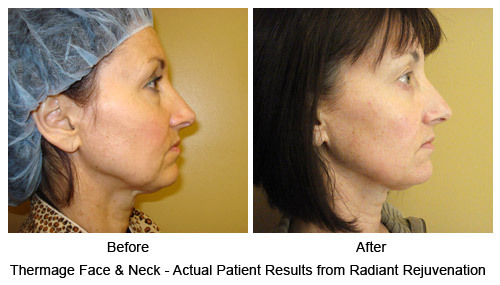 Thermage is a non-invasive alternative to surgical face lift procedures and is performed in a doctor’s office without the need for anesthesia. Thermage is performed in one session which can last from twenty minutes to two hours, depending on the size of the area treated. Since there is no surgery with the Thermage procedure and no injections or sutures, there is no down time, and patients can resume normal activities right away. Thermage can be safely performed on most body parts, including the face, eyes, lips, tummy, arms, hands, thighs and buttocks. And unlike injections or fillers, Thermage works on your entire face: forehead, eyes, nasolabial folds, jaw line, jowls and the area under your chin. A common use of Thermage is in conjunction with liposuction to overcome problems of skin laxity and unevenness after liposuction. Thermage adds proven skin tightening and deep body contouring to enhance the results of liposuction. Also, Thermage has developed a new procedure to reduce the appearance of cellulite by rebuilding collagen connective tissue and improving blood flow to the tissue. Unlike lasers, Thermage works on all skin types and tones. Body by Thermage, Face by Thermage, and Eyes by Thermage are registered trademarks of the Thermage company. Radiant Rejuvenation & Cosmetic Surgery is the first clinic in the Seattle area to offer the new Thermage CPT system (Comfort Pulse Technology), which provides patients a much more comfortable, essentially painless and more effective Thermage treatment to tighten the skin. On September 20, 2010, Thermage CPT was featured on the nationally syndicated Dr. Oz Show. Dr. Doris Day of New York appeared in the "Ultimate Anti-Aging Show by the Decade." Dr. Day discusses aging solutions for women in their 40s. She explains that the Thermage CPT is a great no downtime solution for skin tightening, both on the face and the body. Follow the link to visit our website devoted to the Thermage procedure for more information about Thermage and the new CPT system.